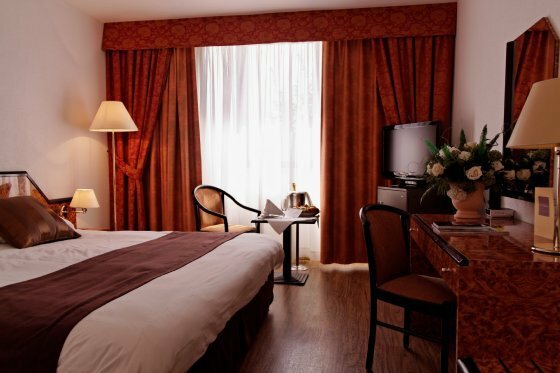 Ideally located at a walking distance from town center, this hotel of 90 rooms with real king size beds and twin beds, including four suites and three rooms for the physically challenged, offers you a very good range of services. Each room is equipped with air-conditioning, press trouser, mini-bar, hairdryer, dataport, safe boxes and coffee and tea making facilities. Nine meeting rooms are at your disposal (total measurement of 650 square meters) for any type of event. From April until October the outdoor pool is open with an outside terrace bar and restaurant. Soft, live music concerts are organized some days during the summer. The hotel is situated closed the Grand Theatre de Provence and Cezanne birthplace. Aix-en-Provence is famous for her Art Lyrique Festival held in July and nearby La Roque d'Antheron Village is famous for his International Piano festival also.